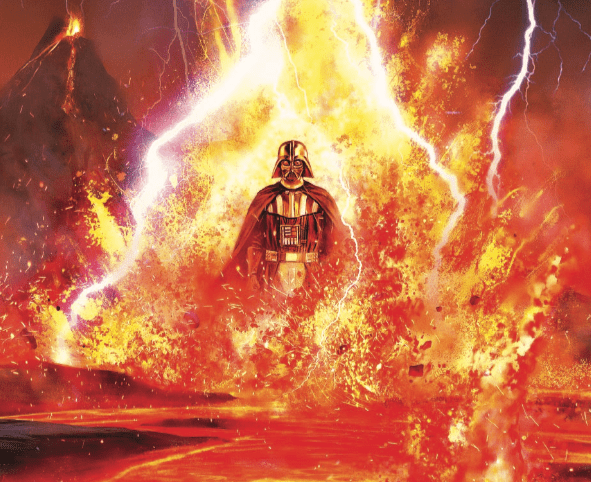 Star Wars: Darth Vader #25 Review – AiPT! All good things must come to an end, even when you’re talking about Star Wars. Charles Soule ends his illustrious run on the series with this final issue, which gives Darth Vader what he wants: A chance to speak to Padme. Or is it all a ruse, as so many Sith things are? Vader is getting a chance to speak to his long lost love whilst the world literally burns around him on Mustafar. His castle is complete, but is the man underneath? This is an issue focusing on Darth Vader’s spiritual journey for some kind of truth and solace. Alas, for a Sith that’s a conclusion none can have. It’s like ‘Star Wars: Stargate Edition’. Last issue, Darth Vader won a lightsaber battle. He’s broken, bruised, and now must take his battle elsewhere to a place where his body isn’t needed. Soule and Guiseppe Camuncoi introduced a fascinating visage of Vader when in meditation mode and that visage is used quite a bit here. He basically takes his spirit self on a bit of a walkabout. As he traverses the lava planet he must fight pesky Jedi, witness his teacher Obi-Wan do battle, and ultimately he gets some new knowledge out of it. It’s the sort of read that doesn’t supply obvious answers and instead requires you to read into the events and pull out what you will. I’m fairily certain readers will be discussing this issue for some time since it’s so obtuse and also seems very important to the man under the black mask. One of the more fascinating aspects of this issue is how it shows Anakin Skywalker’s life from childhood all the way up to becoming Darth Vader. He must swallow the pill that is his life and by the end accept it. Like any good Sith, that requires some maiming and chopping off heads in a great fight sequence. In a few ingenious visuals, the story seems to suggest what’s to come in the original trilogy (this story takes place just before A New Hope). By the end, it’s a good conclusion because it fits so well into the mythos. Camuncoli draws a great issue and I’m happy he’s fully on board this issue after only drawing the breakdowns for much of this story arc. As mentioned above, the action is great, showing a Darth Vader who isn’t slowed down by a broken body. In his swirly spirit self, he can do anything and it’s a reminder of how great of a Jedi he was before his fall. The spiritual nature of this journey he goes on is also well rendered in symbolic ways that are vague enough to make you think, but not so vague you’ll be lost. Vader goes through a lot in this issue, that is for certain, but if you were hoping for definitive answers you might feel disappointed. I don’t know how much wiggle room Soule has with the narrative given this is a prequel, but what we get here is more of a mental test of Vader with spiritual results that may or may not stick. Is he going to grow from this? Maybe, but it’s not certain even he understand what the lesson was let alone the answers to that lesson. A great final issue that puts Darth Vader through a spiritual test that’s awe-inspiring. This issue will not only make you think of Darth Vader on new terms, but it’ll give you new insight into his journey to be the chosen one. Captain Marvel’s origin is finally reset and settled. We think.